Jenise Williams, a first-year kindergarten teacher at Burns Elementary-Middle School in Detroit, is enjoying her rookie year helping students become better readers. At the same time, her district has just publicly launched one of its key new resource tools to improve student literacy called ModEL Detroit. The online program utilizes visuals, single words and short text on projection screens to supplement traditional textbooks and multi-page handouts. “It has been extremely beneficial and I only see it getting better as I become better,” Williams said. The project is a collaboration between the Skillman Foundation, a Detroit-based nonprofit, and StandardsWork and EL Education, national literacy experts. The project is fully funded by the Skillman Foundation. Other districts — in Michigan and across the country — can now take advantage of ModEL Detroit resources by using the Detroit Public Schools Community District (DPSCD) portal. The district publicly released the online tool on March 28. In Michigan, where a new stringent third-grade reading law is set to go in effect next school year, the program could be crucial in helping districts meet government standards. 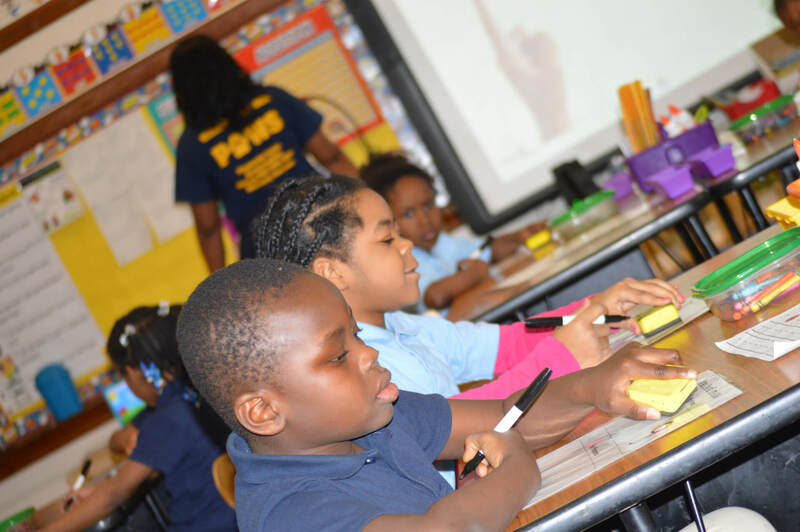 DPSCD’s K-8 teachers have been using ModEL Detroit since last September. With 50,000 students, DPSCD is the state’s largest public school district. Through the use of almost 2,000 PowerPoint slides, teachers are able to use the tool to provide high-quality lesson plans to students and reduce class preparation planning time. It also provides specific support for English language learners (ELL); special education students and readers who are significantly behind grade level. Advocates say that ModEL helps to engage students and increases knowledge retention. “When you build on knowledge as you grow and develop as a reader, as a thinker and as a citizen, you are able to go back and pick up those pieces and make arguments and make sense of your world with voice and great confidence,” DPSCD General Superintendent Nikolai Vitti said. Tonya Allen, Skillman Foundation CEO and president, notes that teachers were an integral part of the development process. Officials from the Detroit Federation of Teachers (DFT), the school district’s largest union, are optimistic as well, but note that new teaching tools alone won’t meet the district’s urgent needs. A majority of Michigan’s third-grade students — 55.6 percent, or 56,850 students — scored as less than proficient on the 2018 Michigan Student Test of Educational Progress, better known as M-STEP. The test measures reading, writing, listening and language. In 2017, the federal government’s National Assessment of Educational Progress indicated that only 5 percent of fourth graders in Detroit were proficient in reading and 4 percent were proficient in math — among the lowest scores in the nation in those categories. It’s not just a Michigan problem. In 2015, almost two out of three fourth graders across the nation failed to score proficient in reading, according to a report by the National Conference of State Legislators. The percentage of non-proficient readers is even higher among people of color: 82 percent of Black fourth-graders were reading below proficiency, as were 79 percent of Latino fourth-graders and 78 percent of those of Native American descent. School officials say that students who did not meet benchmarks for reading proficiency at the end of third grade are four times more likely to not finish high school. In 2016, the Michigan Legislature took action. The GOP-controlled body passed a law that requires schools to identify children who struggle with reading and writing and provide them with additional assistance. If they don’t make significant improvement, however, students will be held back under the law. In a largely partisan fashion, the state House approved the legislation 60-47. In a 25-10 vote, the Senate backed the measure. Then-Gov. Rick Snyder, a Republican, signed it. Democrats argued for local district decision-making and cited research showing that holding back students would create emotional trauma and more harm than good. The new law mandates that third graders repeat the grade if they are more than one grade-level behind, beginning with the 2019-20 school year. Sixteen other states, as well as Washington, D.C., require retention for students not reading at proficiency by the end of third grade. Eight states allow for retention, but do not require it, leaving it to the district’s discretion: Alaska, Colorado, Maine, Maryland, New Jersey, New Mexico, Oklahoma and West Virginia. Michigan districts have been scrambling to prepare for the new requirements. The Detroit Parent Network, a nonprofit advocacy group, held a community forum late last year to help guide families and offer strategies. The new law has sparked trepidation in teachers, as well. Launch Michigan is a coalition of more than 30 groups, including 30 participating organizations including Business Leaders for Michigan, the Michigan Education Association (MEA) and the Michigan Department of Education. The advocacy group in February surveyed more than 15,000 teachers and found that many are dreading the third-grade reading law, as the Advance reported. Only 22 percent of educators are confident their school can offer “substantial” support to students who are held back, and 24 percent don’t believe their school can offer any support whatsoever. Current Gov. Gretchen Whitmer, a Democrat who was elected last fall, wants to scrap the law. But with Republicans still in control of the Legislature, it’s likely that the law will go into effect. Nikolai Vitti joined the Detroit Public Schools Community District in April 2017. With the help of Wayne Regional Educational Service Agency (RESA), which provides services and support to the county’s 33 school districts, his team carried out an audit to see whether DPSCD’s curriculum met national grade-level expectations. “In everyday terms, what that means is that every day when teachers went into the classroom, whether it was kindergarten, third, fifth or eighth grade, they were engaging students at a lower level than the standards expected them to be engaged,” Vitti said. To help address the problem, DPSCD has held dozens of “literacy nights” across the district, where students, school staff, parents and others participate in workshops designed to help with student achievement. District officials see ModEL as another tool they can use to reach that goal. Vitti said the program assists with homework and help families understand what the new curriculum looks like — and why it’s more challenging. “[It’s about] what children are learning, and why, so that parents can be better support to teachers as we go about this change,” he said. So what’s different about Detroit compared to other districts? The concentration of poverty, Vitti said. “We see it in every urban school district, in every area of the country, but the concentration is much broader and deeper in Detroit,” said Vitti, who has worked as a teacher and administrator in both New York City and in the state of Florida. More than one in every three — 34.5 percent — of Detroit residents lived below the poverty level in 2017, according to the U.S. Census Bureau. The child poverty rate, however, is about 48 percent, among the highest in the nation. The statewide averages for both measures are 14.2 percent and 19.3 percent, respectively. Vitti also said that the district’s revolving door of leadership over the last two decades has contributed to the literacy problem. It has been under the thumb of state control for 15 of the last 20 years due budget and academic achievement woes. Since 1999, the district has had 13 leaders who have been either a general superintendent, a CEO or an emergency manager. The average tenure for a superintendent among the nation’s 100 largest public school districts is between three and six years, according a 2018 study from the Broad Center, a foundation for the training of school administrators. Citing poor academic performance, Michigan’s former Republican Gov. John Engler led a state takeover of Detroit Public Schools in 1999. Through mayoral and state appointment, a reform school board was created, and a CEO was hired who had unilateral power to enter into contracts and make curriculum and staffing decisions. During the five-year period following, from 2000 to 2005, the district lost more than 30,000 students and closed almost 50 schools. In 2004, then-DPS CEO Ken Burnley announced that the district was facing a projected general fund deficit of $150 million. By 2006, the district closed Cooley High School and Redford High School, both located within four miles of Jenise Williams’ Burns Elementary-Middle School. After the state law ended and a locally elected school board regained control and appointed its own general superintendent, then-Gov. Jennifer Granholm declared in 2008 that the district was undergoing a financial emergency. Direct state intervention therefore returned, and continued through 2015. In June 2016, then-Gov. Rick Snyder signed into law a $617 million state aid package bail out the school district. The plan approved by the Republican-led Legislature helped to pay off $467 million in operating debt and provide $150 million for the district to move forward. Snyder said at the time that the legislation gave “Michigan’s comeback city a fresh start in education.” Today, the district manages day-to-day operations through a locally elected school board and general superintendent, but with oversight by a state-appointed Detroit Financial Review Commission. Some educators believe that the ModEL resource tool will help bolster student achievement and right the ship toward a more independent future for the district. Vitti agrees and said that this is a chance for Detroit to be a rare national leader. “How often have we seen something coming out of DPSCD that is going to be used across the nation in large urban school districts?” he said.